Cataracts are the leading cause of blindness in the world. Within the US, more than 20 million people age 40 and above and half of all Americans older than age 65 have a cataract. Although cataract formation correlates strongly with age, factors such as ocular trauma, diabetes, UV exposure, smoking/alcohol abuse, etc. also contribute to cataract formation. 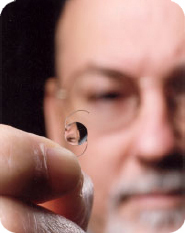 Fortunately, 90% of cataract surgeries, a procedure which removes the lens followed by implantation of an artificial lens (intraocular lens - pictured to the left), are successful in restoring useful vision. Day care, high volume, minimally invasive, small incision phacoemulsification with quick post-op recovery has become the standard of care in cataract surgery all over the world. But post-op complications (e.g. secondary cataract formation, glaucoma or even retinal detachment) call for the need for continued improvement upon intraocular lens design. Recent advances in design include foldable delivery and implantation, haptic design and surface coatings. The links above will guide you through a short glimpse of IOL implantation procedures, current technology and current research clinical ophthalmology.